A song early in the morning just evoked a lot of thoughts in my mind. It was a usual morning, of a usual mother of two, getting one ready for school and feeding the other. I have flown with my love Indigo for over 5 years. And now I am a mother of two, a three year old adorable girl and a two month darling baby girl. It was a usual day of struggle, juggling with my responsibilities, bathing my kids and feeding them their breakfast, along with getting ready for a meet at my girl’s school. Random songs were being played on the television, when a song just gave me goosebumps. My whole life came as a flashback in front of me. The song from the movie ‘Neerja’ , ‘ aankhein milayenge darr se’ started playing on the television. I turned around and came to my room as if it was calling me. I felt a strange urge to stop what I was doing and look at the television screen. The song shook me. It just brought tears to my eyes, not because I was feeling sad about what had happened with Neerja in the movie, but for some other reason. A reason that has just changed the way I was looking at my life currently. I was at a point in my life where I needed strength. Strength to raise both my girls in a great way, strength to be able to manage things, strength so I would be able to explore new horizons in life along with taking care of my babies. But somewhere down the line I was breaking down, which I wasn’t accepting. I was confused and lost, until I heard this song. It just shook me. Shook me up from a silly, lost, lazy me. Lazy??? Well not really, my girls would let me be lazy anymore, but definitely I felt lost. Lost about the fact whether I would do justice to both my girls, lost about the fact if I could still have fun in life. Yes this song made me realize the biggest truth of my life. The truth, that I am Neerja. The truth that I will be Neerja all my life. She was a brave young girl who did something that has made her a Hero. The flashback of my flying days, made me rethink about my present life. I was a cabin attendant, a girl who was trained every year several times so she could save lives on board. I was a cabin attendant who got to save a lady who ran short of oxygen right after the take off. I was the cabin attendant who with the help of a doctor saved the life of a passenger who was getting recurrent epileptic attacks on the flight, and who could have lost his life if things were not taken care on time. I was the cabin attendant who saved a little girl who was travelling alone, from a sick passenger who was trying to physically harass her, and handled the situation discretely so that the girl would’t be bothered, and at the same time the culprit was punished. I was the cabin attendant who took a stand for her junior who was physically handled by an unruly passenger. I was a cabin attendant who have served infinite number of passengers with my heart and tried to make their day really special. Yes I was a cabin attendant. N yes I was NEERJA. I was Neerja, because I was a fighter then. I am still Neerja because I am still a fighter. 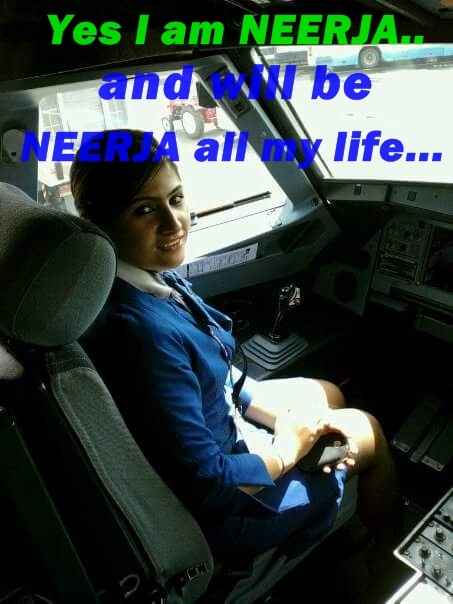 And I will be Neerja all my life, because that’s how I want to live my life. Fearless, fighter, courageous, cheerful, caring and fun loving. I was she then and I would want to be she all my life. Indigo had been my life. It was a passion, an addiction. What I am today, I owe it completely to Indigo. I am grateful to Indigo for letting me be NEERJA. The song, yes just a song has just put my life upside down. It has made me realize my own worth. It has made me realize about what I can capable of. If I was capable of saving so many lives on board, then yes I am definitely capable of being a good mother and raising my girls in a beautiful way. I would no longer question my capabilities. If life gets tough, I will get tougher and will make it beautiful for my family. Thanks Indigo and Neerja, and this wonderful song for changing my perspective. Thanks for making me fearless again, how I was when I was with Indigo. Wake up world. It’s high time we realize that the cabin attendant is much more than just a server on board, its high time we realize that a cabin attendant is a fighter who will do anything to save your life.